Discussion in 'Proposals' started by Cenisa, Apr 17, 2019 at 1:14 AM. 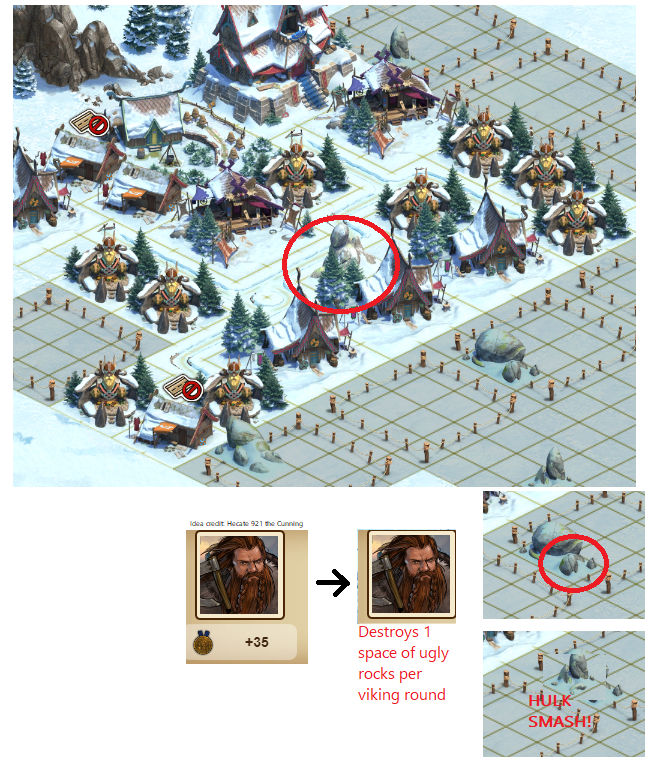 Give emissary an additional effect useful for the viking village instead of making me cry pacific ocean for completeing my viking village. Currently as HMA, I am getting 35 measly medals for completeing a whole round of viking. If this BIG BARBARIAN looking man could SMASH ROCKS like HULK, that would be amazing. Think of all the children you could save by breaking rocks! They could have more farming space and more sheep to eat and more horns to pull. -1 . Where do you think the greater runestones come from? No. There's meant to be extra challenges in the settlements. Cenisa and Godly Luke like this. Hmm, tough cookies. Alright! Going for Emissary idea #2. Come check out my new and improved idea~ Thank you! Oh I know, I know, maybe it could give 10 happiness too. I've often thought that my progressive era explosives should have a real use, like blowing up obstructions in my Viking Settlement. Maybe 10K to blow up a one square obstruction and 25K to blow up a two square obstruction.